Our new bedroom is lovely; roomy, light and airy and thus far, devoid of clutter. 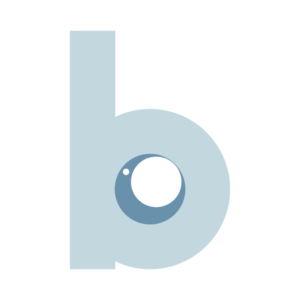 However this is mainly due to the fact that a lot of our ‘stuff’ is still hidden in the kids’ rooms, because when it comes to bedroom storage we aren’t quite there yet. We were offered a grey Songmics storage bench to review. 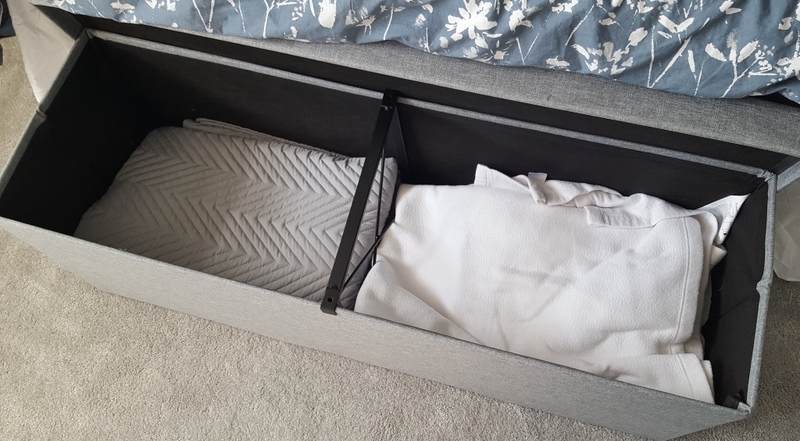 I thought it would be a great and very useful addition; somewhere to keep our many bulky throws and bed sheets and fortunately, the grey linen-style finish just so happened to fit in exactly with our blue/grey bedroom colour scheme! 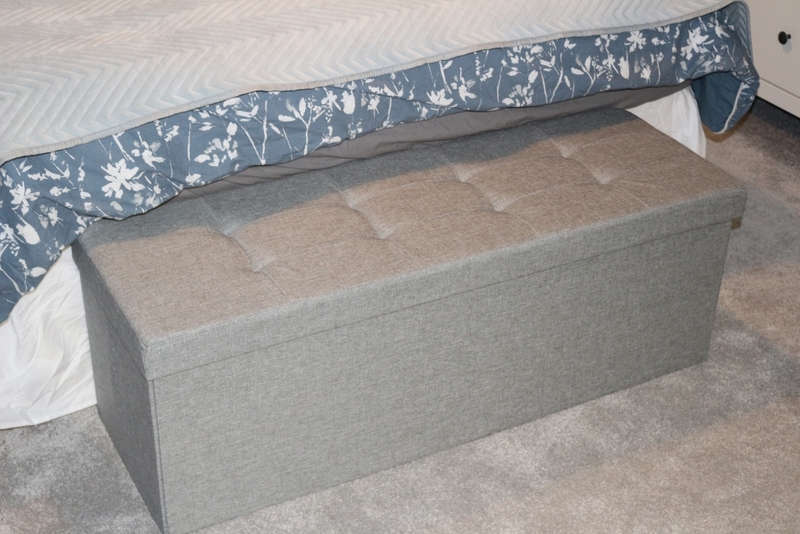 The Songmics ottoman/storage bench has has a padded, comfortable seat which lifts off completely so that you can store things inside. It is 110cm long, 38cm deep and 38cm high, and has an overall capacity of 120 litres. The storage bench itself is made from MDF and is surprisingly sturdy. It claims to hold up to 300kg in weight; that’s at least three grown adults! It also folds away for compact storage if it’s not needed. 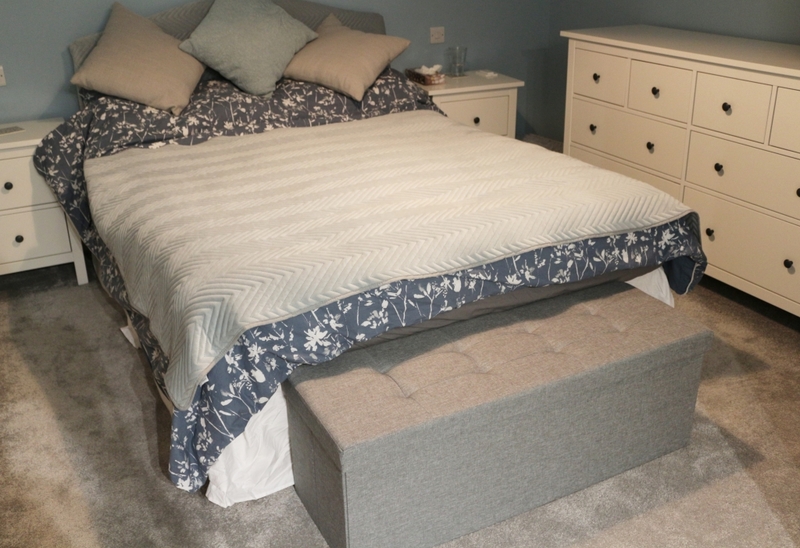 The bench fits well at the foot of a double or king size bed, although it could also be used in a living room as a foot stool or in a hall or entry way to store shoes etc inside. How does the Songmics ottoman/storage bench go together? 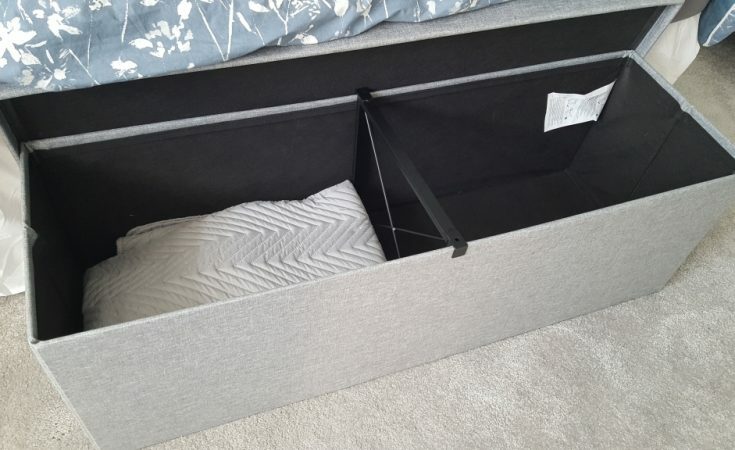 Although there are no instructions in the box so you will have to work it out for yourself, it’s a very simple item of furniture to put together! It comes in four parts; the box, the base, the lid and the divider. The main box folds out, and there is a flat black base (which you can prize out from inside the lid) which goes into the bottom to make the box rigid. 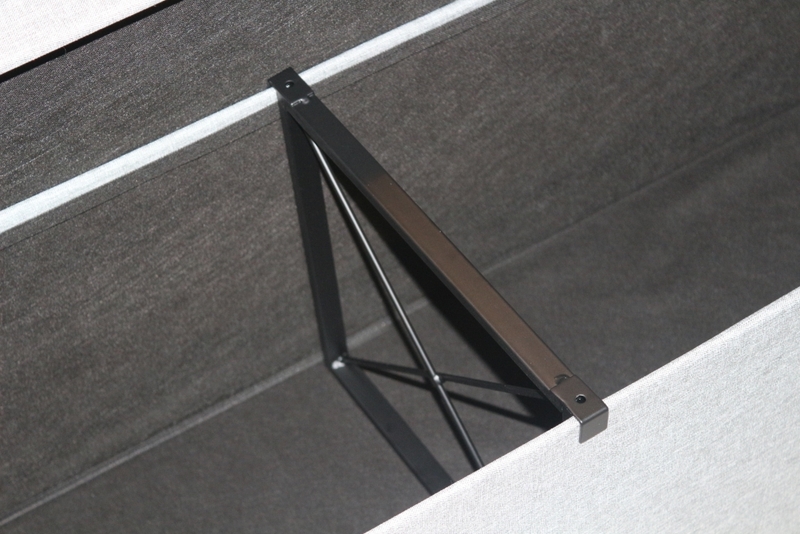 There’s a single metal support brace, which placed inside acts as a separator to divide the space. It appears to hold the bench in a sturdy shape. Once the lid is on you can sit on it without any bending or sagging. I’m almost certain it will be used by the children as an easy way to climb into our bed; perhaps not as well thought out as I first thought! 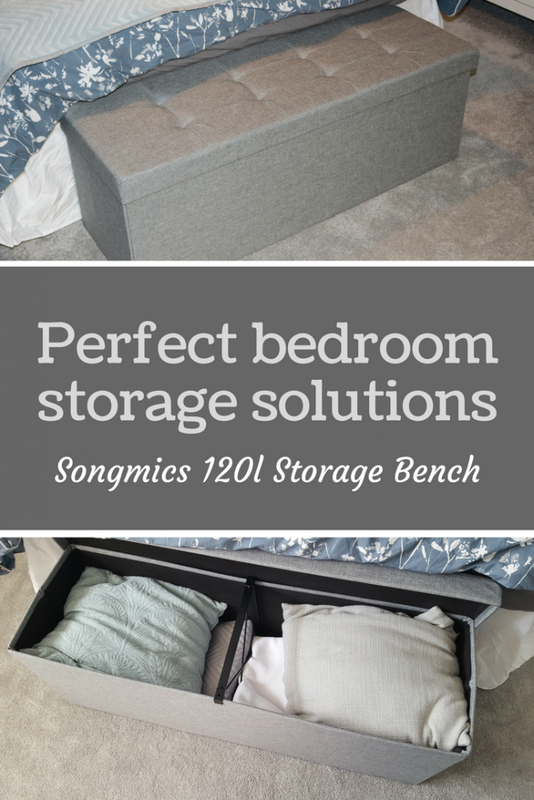 What did we think of the Songmics storage bench? I’m really happy with how well it fits into our room! It’s a great place to sit and put one’s socks on in the morning and an even better place to store things out of sight; it holds a surprising amount. It is the perfect storage solution for winter jumpers (wishful thinking, maybe? ), spare bedding or toys. 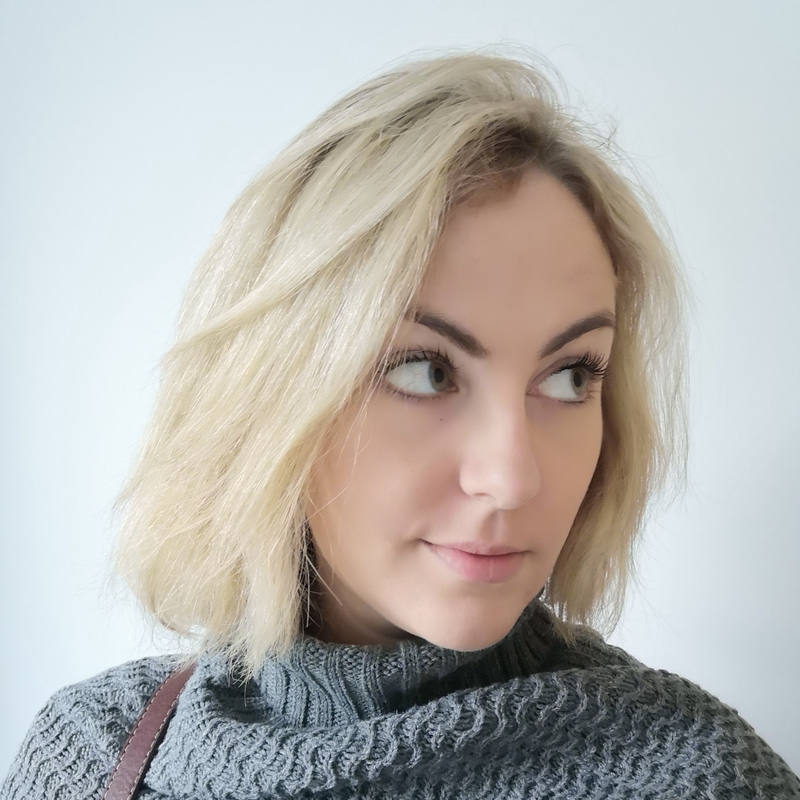 I am impressed with the quality; for the price I think you would be hard pressed to find something with as large a capacity which you could sit on with no worry of collapse! 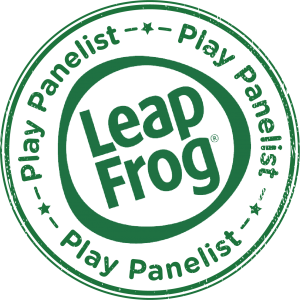 I will consider getting some for our playroom for the bulky toys that don’t fit anywhere else, while also providing additional seating for guests. The Songmics storgage bench/ottoman is available in other colours (including this beige storage bench which would work well in our living area) and also in beige or black faux leather. There are also shorter storage benches available. Would you like to WIN a Songmics storage bench? This storage bench was given to us free of charge for the purposes of this review, but images and words are mine. Check out Songmics on Amazon for more storage solutions!